A senior Palestinian official on Tuesday likened Benjamin Netanyahu to the leader of the Islamic State group, after the Israeli prime minister compared Hamas to the organization. 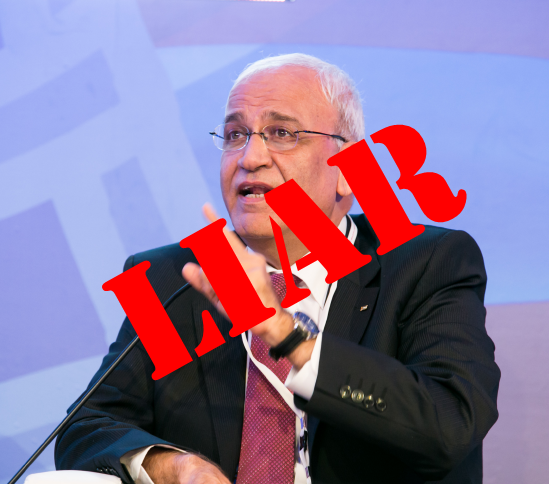 “Netanyahu is trying to disseminate fear of the Islamic State led by Abu Bakr al-Baghdadi, but Netanyahu forgets that he himself leads the Jewish state,” said Saeb Erekat, the PLO’s chief negotiator in peace talks with Israel. “He wants us to call Israel the Jewish state and supports terrorist settlers who kill, destroy and burn mosques and churches… like Baghdadi’s men kill and terrorize,” Erekat told AFP. By contrast, Israel has no state religion. So by Erekat’s definition, the PA is far closer in its laws to the Islamic State than Israel is.